Plus, Oakland lowers bill for Warriors’ 2017 parade. 1. 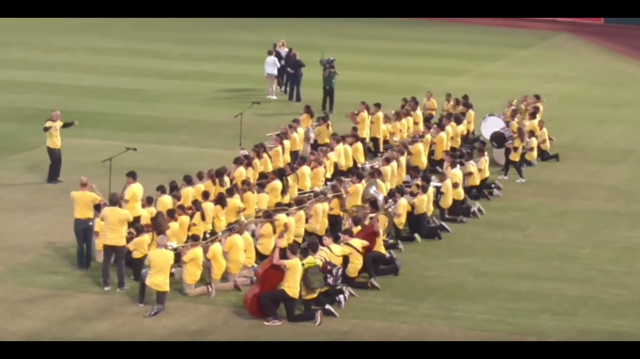 Oakland public school students took a knee last night as they played the National Anthem at an Oakland A’s game, reports Lisa Fernandez of KTVU. In addition, A’s fans gave a standing ovation to team catcher Bruce Maxwell, who on Saturday became the first Major League Baseball player to take a knee during the anthem. 2. The Bay Area economy grew three times faster than the national average last year, reports Riley McDermid of the San Francisco Business Times$, citing a new report from the Center for Continuing Study of the California Economy. The San Francisco-Oakland metro area grew 5.4 in 2016 — the second fastest in the state, after the San Jose area. Job growth, however, has slowed in 2017. 3. The city of Oakland lowered its bill to the Golden State Warriors for the team’s 2017 championship victory parade by about $29,000, reports Matthias Gafni of the East Bay Times$. The Warriors had promised to pay for the parade but this summer balked at some of the expenses billed by the city. Oakland says the cost of the parade is now $787,000, plus the city is asking the team to pay $244,000 for the 2015 parade. 4. Berkeley police found nearly 700 pounds of psychedelic mushrooms valued at about $1 million in a home on Alcatraz Avenue, reports Nanette Asimov of the San Francisco Chronicle. Police were responding to a domestic violence report at the time and arrested a couple who occupied the home. 5. Uber and Lyft motorists accounted for about two-thirds of the traffic-related violations in downtown San Francisco, reports Joe Fitzgerald Rodriguez of the San Francisco Examiner, citing police department data. Uber and Lyft drivers repeatedly were cited for driving in bus and bike lanes and obstructing traffic. 6. The Hepatitis A outbreak in San Diego County has resulted in 16 deaths and sickened 450 people in the past few months, reports Jeff McDonald of the San Diego Union-Tribune. City and county officials are coming under fire for failing to install portable toilets for homeless people and thus allowing the highly contagious disease to spread through unsanitary conditions. 7. The governor of Puerto Rico says the island is facing a massive humanitarian crisis and is pleading for help from Washington, D.C., but so far, the Trump administration has been slow to respond to the devastation wrought by Hurricane Maria last week, CNN reports. The massive storm left millions of people without drinking water and electricity. 8. At least six White House advisers, including Jared Kushner, used personal email for official business this year, engaging in some of the same activity for which President Trump strongly criticized Hillary Clinton during last year’s campaign, The New York Times$ reports. 9. And Senate Republicans are preparing to pull the plug today on their latest attempt to repeal and replace Obamacare after yet another GOP senator — Susan Collins of Maine — came out against the plan on Monday, The New York Times$ reports.